Not Invergordon Academy. Pitcalnie Primary School. Left to Right. Front Row: Johnnie Skinner, William Sutherland, Duff?, Johnnie McLennan, Patrick Swanson, Roddie Matheson, John Garrow, Allister McLeod. (Headmaster's son - left) McAllister ? Middle row: Gordon Macallum, jack Kenneth McDonald, ?, Michael Christie, Joyce ?, Cathrine Duff, ?, ?, Elrhine Hendry, Joyce McLeod.Robin Sutherland, Jack Bain. Upper Middle Row: Ronald McLennan Jim Fraser, Isobel Laing, ?, ?, ?. Upper Row: ?, ?, Isobel Hendry, Margaret McDonald, ? McAllister?, Don Christie. Headmaster Mr. McLeod & Miss Elma Melville. My family often talked about Pitcalnie School and I found them in this photo. 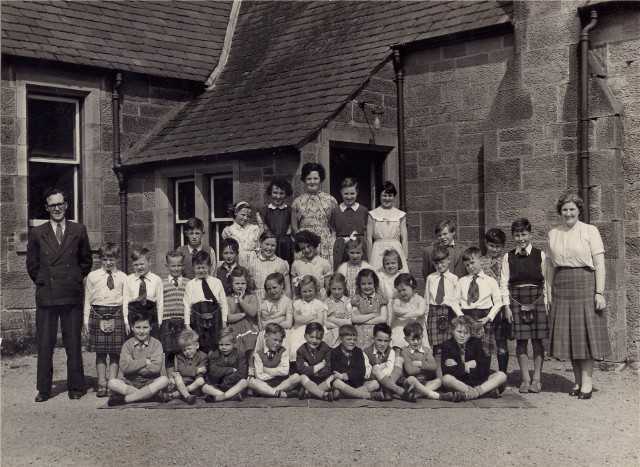 In the middle row it is Catherine Duff and in the front row it is Angus Duff. Thanks Pat for posting this photo. I've contacted my brother and sister and told them about it; it brought a smile to my face when I saw it. Jim Fraser who currently resides in Alness and is married to a schoolmate of mine at Invergordon Academy, Christine Matheson, is my cousin. At the time of this photograph they lived at Cullisse Farm where my uncle, Tommy Fraser worked. Tommy was the son of Sandy and Nell Fraser, Inverbreakie (my Granda and Granny) and the brother of my dad Sandy Fraser, Parkhill, Kildary and my Auntie, Cathie Rose (nee Fraser) who resided at Salvasen Crescent, Alness. Both are now deceased. Jim Fraser, featured in this photograph, also has a sister Margaret and brother Tom who were probably too young to be at school at the time. Their mother, Hilda Fraser lives at Kendal Crescent, Alness. Wonderful photo - remember the school with great pride. Want to forget the number of times I got the strap from Mr Macleod.